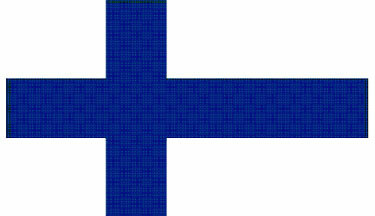 The flag of Finland was officially adopted on May 29, 1918. The off-centered blue cross is based on the Scandinavian Cross, a cross widely used on Scandinavian country flags. The blue color is symbolic of blue skies, and the thousands of lakes in Finland. The white represents the winter snows.